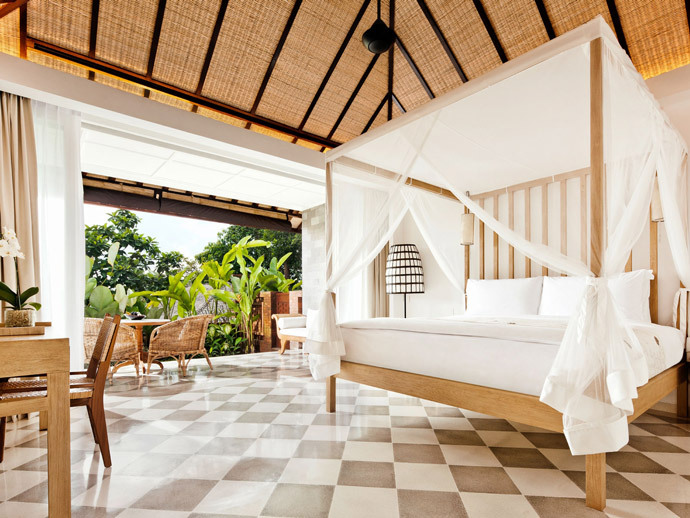 Where To Stay In Ubud? Lets Get Oriented. When we talk about staying in Ubud, that really means two different options, staying in the village itself and staying in the outskirts. In the map above, you can see Ubud Village, with the main streets being Monkey Forest Road, Jl. Hanoman and Jl. Raya Ubud. There are lots of pros to staying in the Ubud Village. If it’s your first time to Ubud it will make it easier to explore the streets, eat at the restaurants, go shopping and visit different spas. 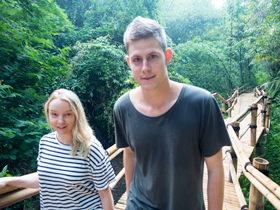 You will also have easy access to Ubud Monkey Forrest. However, staying in Ubud village will mean that it will be more touristy and much busier than if you stay in the outskirts, and depending on what you do, you may miss out on some of the natural beauty. You can overcome this by going on rice field walks, visiting waterfalls like Tegenungan and getting a private driver etc. A lot of Ubud accommodation is located in the outskirts of Ubud, some not too far away from the village, others perhaps 30 minutes away. These hotels are often surrounded by the beautiful jungle or rice fields and offer experiences to explore the surrounding nature and community. Your hotel may offer free shuttle transport into the village. Despite this, you will still be a little more isolated and may not have the same amount of time to explore the village. Having said that, If you’re staying in a beautiful hotel with restaurants, pool, a spa and other experiences, the isolation won’t be an issue, rather a time to relax. There’s no right or wrong option, just different. We’ve stayed in both the village and different areas around Ubud and have absolutely loved all experiences. We love using Booking.com, it’s one of our favourite ways to book Ubud accommodation and they have a great range of options. 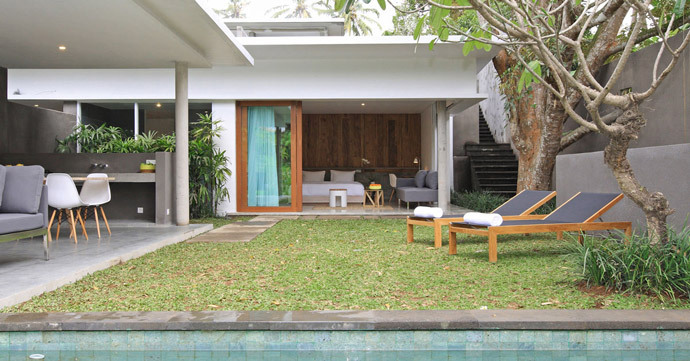 Airbnb tend to have a lot of villa options for Bali, so another good option if looking to stay in a villa. Often have discounts for stays of a week or more. We have been lucky enough to stay in lots of amazing accommodation throughout Ubud, but we haven’t stayed everywhere and want to make sure we are recommending the best. 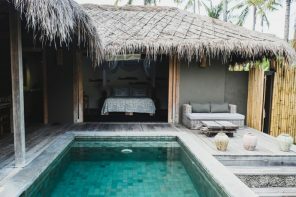 So our Ubud Accommodation recommendations below are based on our favourites that we have stayed in, knowledge of Ubud hotels and their specific locations throughout Ubud, lots of research, reading reviews, hearing from you guys and just putting this all together with our own experience of Ubud. Please note: Prices were accurate at the time of this post and are per night. 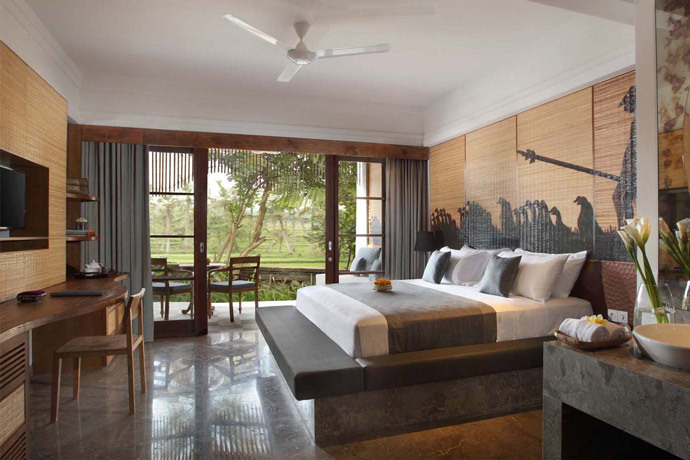 Padma Resort Ubud only just opened at the beginning of 2016. We have such beautiful memories from our stay, from the amazing infinity pool, to the delicious food, and beautiful rooms. Padma Resort Ubud have stunning grounds including a walking path through the surrounding jungle. As cliched as it sounds, the thing I loved most about Padma Resort Ubud was the helpful and kind staff. It made our stay here something more. Read more about our stay here. Our stay at Alila Ubud was fantastic. We had great food, beautiful surrounds, a beautiful pool and friendly staff. We loved doing one of their Alila Experiences, where we walked through the local community and rice fields. Read more about our stay here. Mandapa, Ritz-Carlton is another new addition to Ubud. 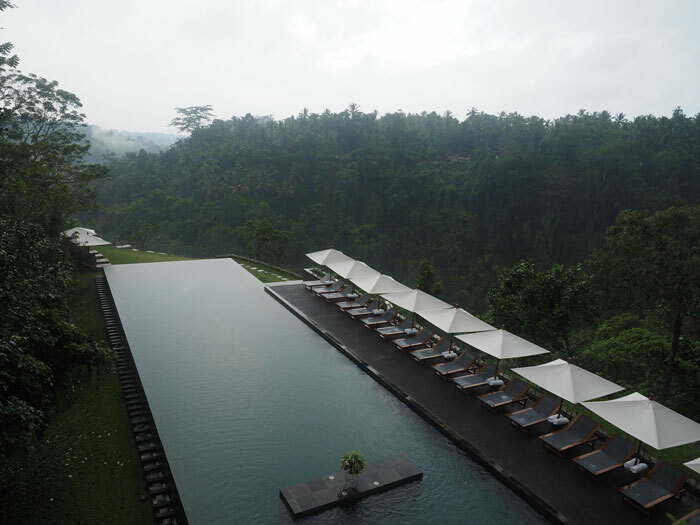 A stunning hotel which comes well reviewed, located in the outskirts of Ubud. 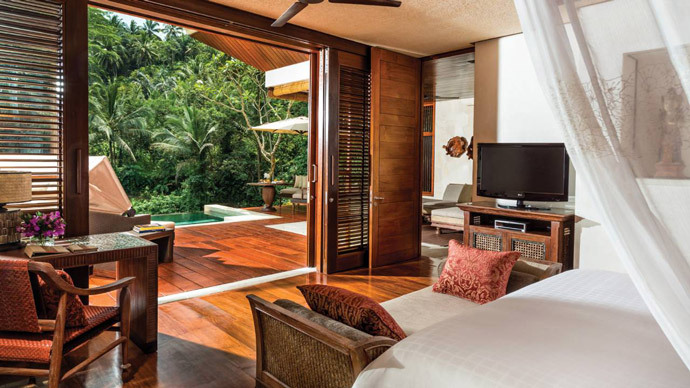 Set amongst tranquil greenery, the Four Seasons Resort Sayan is a beautiful resort. The rooms and grounds look beautiful and it comes well reviewed. 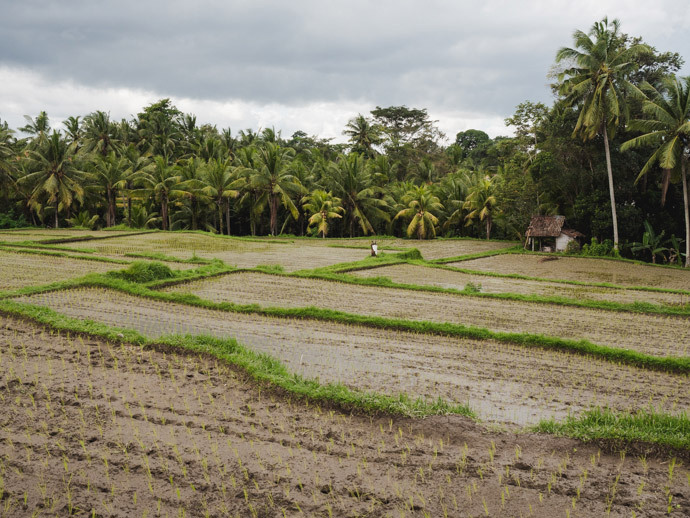 Although it’s on the outskirts of Ubud, capitalising on scenery, it’s also only a 10 minute drive to Ubud Village. 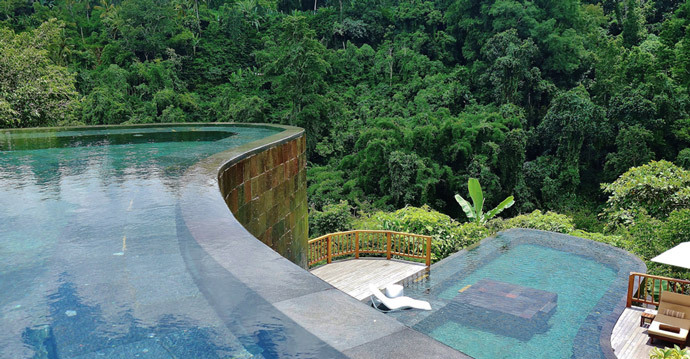 Hanging Gardens Ubud has one of the most iconic pools in Bali. 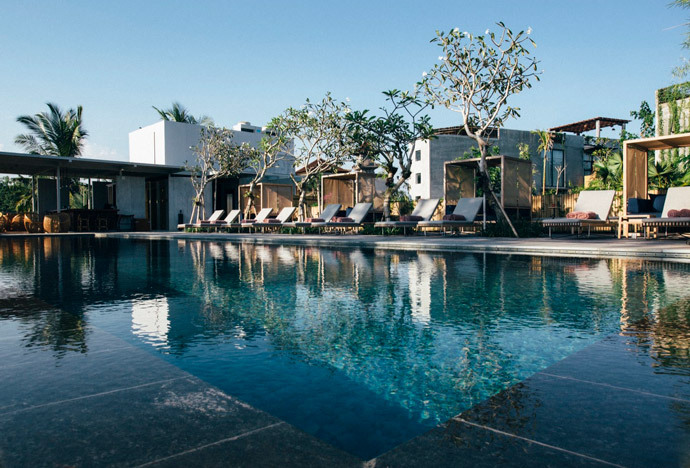 Set in the beautiful outskirts of Bali, it’s a beautiful hotel that comes well reviewed. Kayumanis Ubud is located in the outskirts of Ubud, but only about a 10-15 minute drive to Ubud Village. A well-reviewed, beautiful hotel. 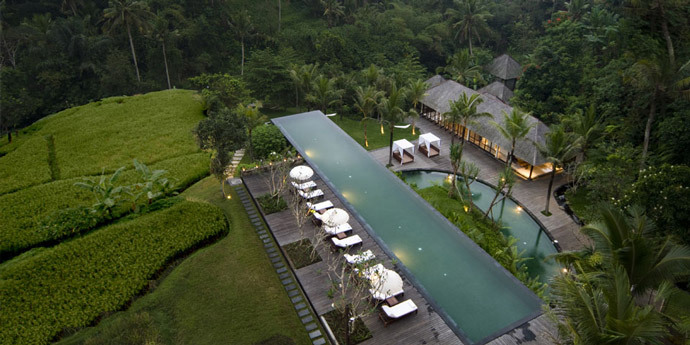 Uma by Como Ubud is a beautiful hotel located only just on the outskirts of Ubud. Although a free 5 minute shuttle is provided to Ubud, it is still possible to walk into the village if you’re happy too. We loved our stay at Royal Kamuela Villas. Although it’s located in the centre of Ubud Village, it still feels like your private, quiet sanctuary being set back from the road. Royal Kamuela has 12 pool villas. Located on Jl. Bisma, Komaneka at Bisma is a great location, still within Ubud Village but on a quieter road. You will find Komaneka at Monkey Forest right in the centre of Ubud Village. Perfect if you want to spend your days exploring Ubud’s streets. Another hotel located on Jl. Bisma, which means you will still be within Ubud village, but far enough away to get some tranquility. A beautiful hotel wth great reviews. 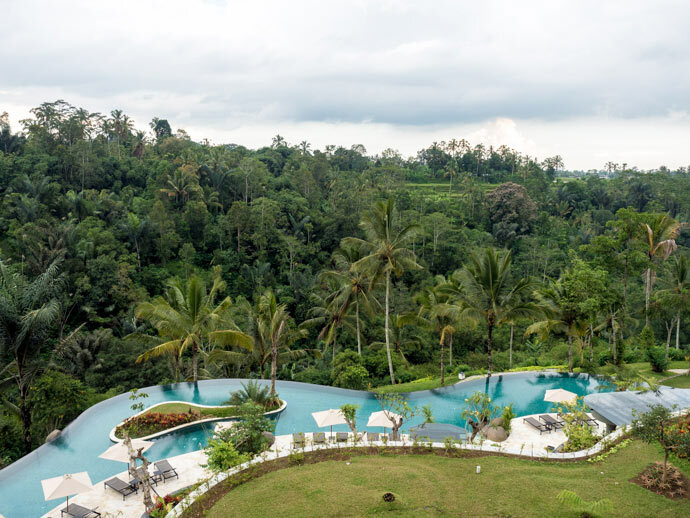 Kamandalu is located in the outskirts of Ubud, surrounded by beautiful tropical greenery. It consists of rooms and villas with beautiful grounds. Read more about our stay here. Warwick Ibah is beautifully designed in line with Balinese traditions. It’s located only 5 minutes walk from the centre of Ubud, making it convenient to explore Ubud. The Ubud Village Resort is located just on the edge of Ubud Village, either a bit of a walk or a free shuttle into the centre. We are yet to stay here, but it looks like a beautiful hotel that comes well reviewed. Aria Villas Ubud are only a 10 minute walk into Ubud centre. They are private villas with a modern design. 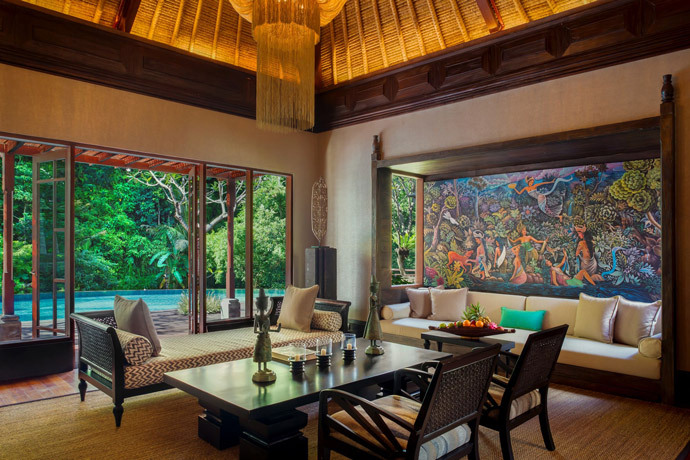 A great location in Ubud Village, with a great design. 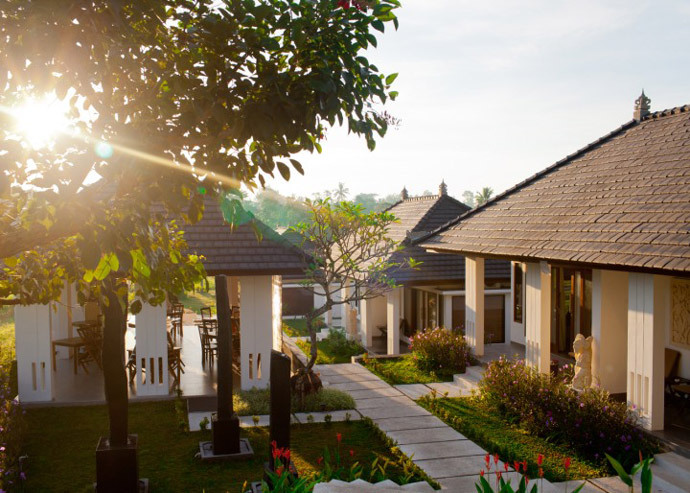 Located in the outskirts of Ubud, Puri Sebali Resort is a nicely designed hotel with a 20 minute shuttle to Ubud. Samara Villas and Restaurant are located within Ubud Village. Please note that the hotel is in a car restricted area therefore the hotel provides a 400m motorbike shuttle service to reach the hotel. Samara Villas have a beautiful design and come well reviewed. 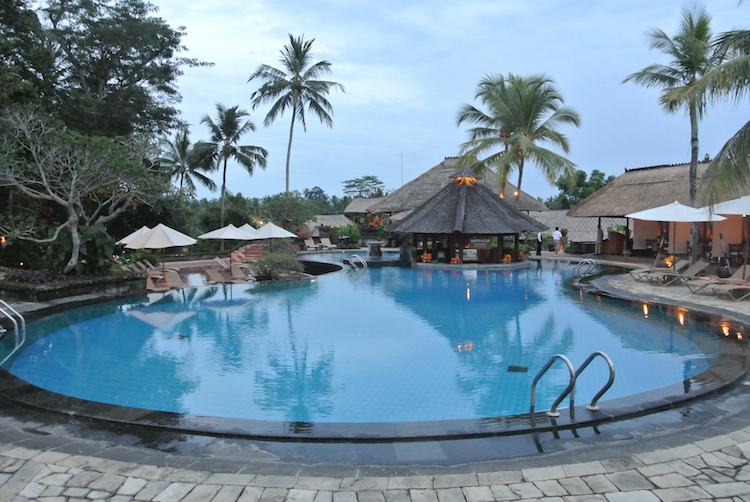 Sankara Resort is located on the outskirts of Ubud, but also provide a free shuttle into Ubud Village. Tebesaya Cottage offers value for money, with a great location in Ubud village but on a quieter street. 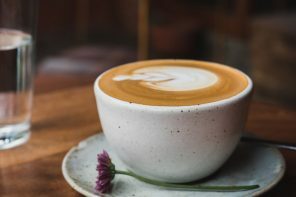 We will be continually updating this post with any new places we stay and love, to make sure we are recommending the best Ubud Accommodation. 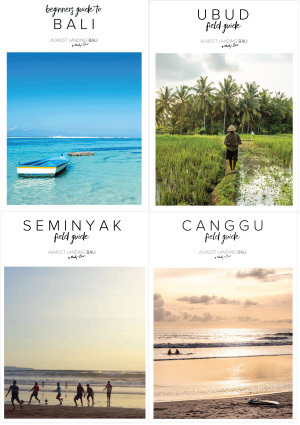 Once you’ve found the perfect place to stay in Ubud, take a look at our Ubud Field Guide for some more inspiration. 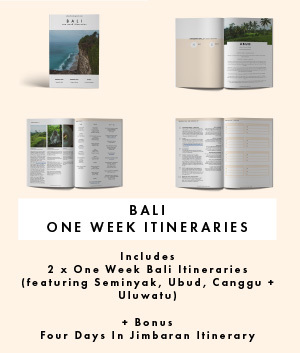 Our Ubud Field Guide has everything you need to hit the ground running, including our favourite food, culture, shops, things to see + do, day trips, walks and short walking itineraries. 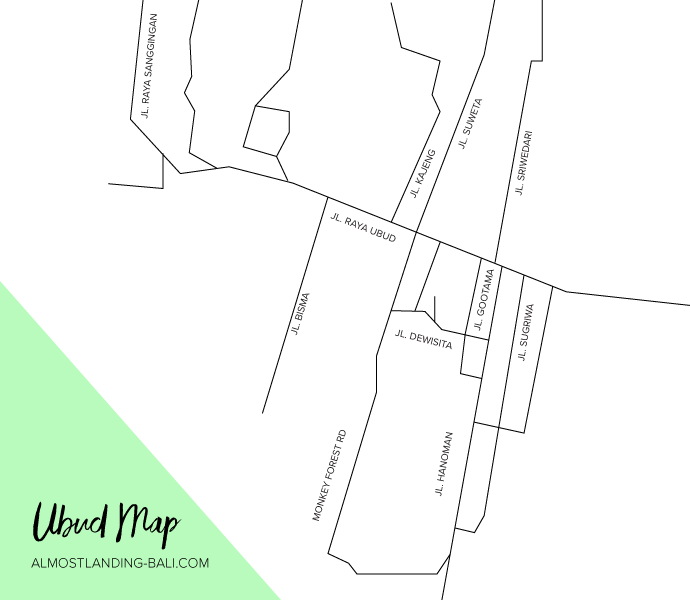 We’ve also put all of our favourites onto our own Ubud Map so you can literally just take it out with you and no research or planning is required. Great review and it does make sense “There’s no right or wrong option, just different”. I am so trouble now for the first time going with my family (boy age 14 and a girl age 4), with knowing kids sometimes they love the ambience of being in a hotel, resort or like a villa with good surrounding. Any recommendation if I should just stay at around Kuta or just split my stay between Ubud and Kuta? At this point just could not decide if I should stay like in a private home / villa or just purely in a hotel. Hope the rest share their experiences and places for newbies places to visit in Bali and of course some shopping area for materials like paintings and bedding materials. Hi William, both options offer a different experience but both options are great. If you stay in the outskirts/surrounds some of the resorts/hotels have stunning grounds and nature but it might take longer to get into the main streets of Ubud. Perhaps look at some hotels/resorts with nice grounds/nature closer to the main streets of Ubud (refer to the map in this article) I would still say to split your time and stay in Ubud it is a great destination to stay. How long is your trip? Greetings, looks like Ubud remains the favorite place or a better destination rather than Kuta. I don’t really prefer noisy and with a lot of bistro’s around due to its ambience kinda a noisy. Length of stay between 5D/4N or 6D/5N. Indeed planning to split my stay if 6/5 between Ubud and Kuta. Since my son aged 15 is more likely prefer some lively place, so called clubs and more of expatriates around for surfing, he will likely enjoy modern ambiance compare to village, padi field or outskirts. Maybe 5/4 would be just nice for a first time visit – my gut feeling unless I have really places to visit to kill my time. 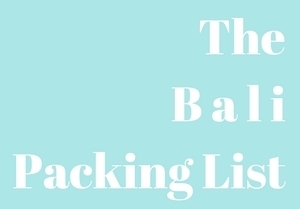 Great blog you have here, really helpful. Weve never been anywhere this exotic so looking forward to coming. Ill be coming with my wife and 3 children, my mind is boggled by all the different accommodations on offer!! Are they all pretty safe? Thanks so much Simon, you will love your time in Bali I’m sure :) Picking accommodation can be so hard in Bali, but that’s a good thing as there are so many good options! 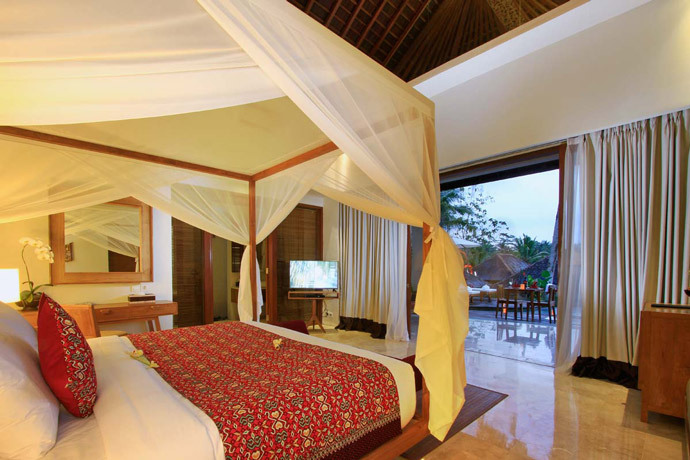 We have always had good experiences with accommodation of all types in Bali. Wishing you and your family an amazing trip and please reach out if you have any other questions or can’t decide where to stay! 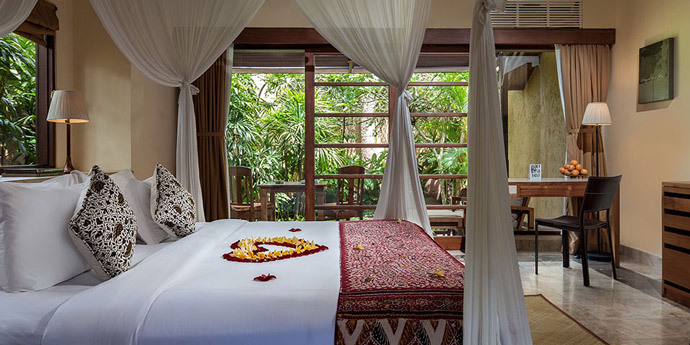 I’ve just booked a stay at the Padma Resort in Ubud in May after reading your post. I’ve decided to stay in Ubud for 2 nights. I am trying to find a beautiful beach to relax at for after (I’ve set aside 3 nights for this) then was going to spend the final night staying somewhere fairly close to the airport for peace of mind (was thinking nusa Dua). Can you recommend a beautiful beach that is quiet and relaxing with white sand and clear waters that would be easy to navigate to from Ubud and then to Nusa Dua? I really wanted to do the pink beach near Komodo Island but it’s a 6hr flight back to Singapore where we’ll be returning to and I don’t want to be travelling more then 3hrs anywhere if I can help it as we’ll be having a lovely long journey back to the UK after! You will love Padma Resort Ubud it’s a beautiful resort :) Some of our favourite beautiful beaches in Bali are in the Bukit Peninsula/Uluwatu area. The accomodation in this area though can be quite expensive, and many do not have beach access. If you want to go exploring yourself we love Bingin Beach, and if you want to stay close-by and spend the day at the beach then you can spend the day at Sunday’s Beach club, which has a beautiful little beach. Take a look at our Uluwatu accommodation guide for the best hotels in this area. Jimbaran is perhaps a good place to consider as you can stay at some equally amazing hotels for much less. Take a look at our Jimbaran accomodation guide and check your dates as some of the dates I checked are currently lower. Intercontinental is worth a look. Ayana also has its own ‘mini’ beach which is really nice but is quite secluded as a hotel. What an awesome blog you have going on here, keep up the good work. Very informative and fun to follow. Me and my wife to be are planning to go to Bali for our honeymoon this March. Our plan is to spend 3 days in Seminyak, 5 days in Ubud, 3 days in Gili Islands and 3 days at Nusa Dua. I was wondering, should we be spending 2 days at Ubud Centre and 3 days at the outskirts? Do you think that’s a good idea, or too much travelling? And which two villas/hotels would you recommend?